Pin It Well, we had all the very best intentions of bringing you a heart felt message heading into Christmas. But as the saying goes - don't work with kids or animals! We did a number of takes and well this video was the best of the bunch and that's saying something. I was totally going to edit it, and I had the best music picked out, but I just can't figure it all out today.... so meh, maybe next year! Also - whilst I am getting in my last bit for the year, I was tagged by the gorgeous Sarwah :) from Tis The Life and the beautiful beautiful Shar from Mum on The Run (do yourself a favour and visit their awesome blogs). These guys tagged me to share what's on my Christmas list and 7 Chrismassy things about me. Well I have done my Christmas wish list and you can find it here. (I have already been totally spoilt and lucky enough to receive the camera and the pod chair thanks hubby MWAH). 1. I am scared of tinsel - seriously it freaks me out. It looks great, but I cannot have it in my house, I am seriously phobic. Clowns and tinsels - there's my two phobias! 2. I am a Christmas Junkie - love love love it. The smells, the vibes, the music, the food - love it all. 3. I go totally overboard with the Christmas shopping. I love giving gifts and I tend to get a little carried away. There is something so cool though about watching someone open a pressie that you have carefully picked out for them. ohhhh I can't wait for Christmas morning. 4. I am a Christmas movie addict - we have all the old classics as well as all the newbies and I love nothing more than movie night with the family every week starting late November and all we watch is Christmas movies. 5. Every Christmas Eve I like to play my favourite Christmas song - Bing singing, Have yourself a Merry Little Christmas. I light a candle and I sit out the back under the fairy lights all by myself and just soak up, reflect and relish in the gorgeous Christmas vibe. 6. I don't like Christmas Pudding, in fact I loathe it. Sorry Mum! Every year I pretend to eat it, but I actually spit it out in my napkin, feed it to the dog or put it in someone elses bowl when they are not looking. 7. I dream of one day taking the family to Colorado for Christmas. Something about the snow, the lights and the Northern Hemisphere style of celebrating Christmas just gets me all giddy. I promise kids, I WILL make it happen. So there you go - my Christmas secrets laid bare for you all to see. On that note - I would like to wish you all a very Merry Christmas. I hope you all find peace and joy with your loved ones and may the year ahead bring you all you ever dream of. Thank you all for all your love and support and I look forward to hiccuping my way through 2012 with you. I am going to take a little break (a week off) from my blog over Chrissy to enjoy some time with my hubby and the squidgins as they are growing up so fast (the kids that is, not my hubby) and I just want to savour this time with them whilst they still consider me cool enough to hang out with! I also intend to spend some time reading all my mags that have piled up, get some home projects done and do some catch up reading on my favourite blogs. But I will be back - consider that a threat or a promise (depends if you're a pessimist or an optimist) and I have stacks of new fun and totally crazy stuff lined up to share with you in the new year. I won't give anymore away, but make sure you check back in after Christmas. So my friends I wish you good tidings, good luck and I'll see you all on the other side of Christmas where hopefully you will find me sane and in reasonable condition. Last but most certainly not least - I was given the wonderful Liebster Award from Kirsty who owns the beautiful Blog Coral and coast which I recently discovered and fell in love with. (Liebster meaning 'dearest' in German) is given to inspirational bloggers with less than 200 followers. On receiving the award you must pass it on to another five bloggers. Pin It Congratulations to Sallyrob77 - You are the winner of the Fabulous Inner-B 2012 Diary. Thank you to everyone who entered - you had some fabulous tips on staying organised that I totally intend to use. I wish I had diaries for all of you. Sallyrob77 - can you please email me your details to lifelovehiccups@optusnet.com.au so I can get your prize out to you ASAP. Congratulations again and enjoy! Please note the winner has 48 hours to claim your prize or it will be redrawn. Sure she has done some damage. Ahem slight understatement. Need a reminder? I stopped photographing all the damage, because I decided it really wasnt something I wanted to remember and relive the pain of in the future. Ok she eats her own poo and is a total klutz, but hey clumsy is a prerequisite in this household. Milly has won us over well and truly. We all heart her and she has especially won the heart of my middle son Sam. 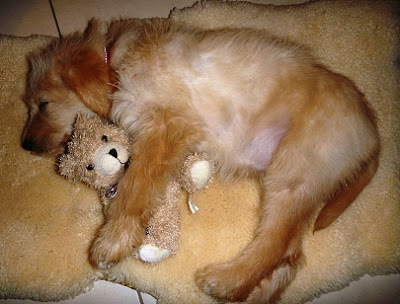 These two have become the bestest of buddies and they just adore each other. This weekend, despite all the rushing around and festivities, I enjoyed just taking the time to watch these two in action. I felt like an outsider watching a love story played out before me. So whilst I have a million things I was going to write about this weekend, I decided to go with the one that made my heart sing the loudest. What did you get up to this weekend? I would love to share in your comments what wonderful things you did or if you have a blog, please link up your weekend post so we can all have a sticky beak and enjoy. Grab the Wonderful Weekends button and post it in your sidebar or in your Wonderful Weekends post. Add your post url to the linky thingy (totally a technical term) in the Wonderful Weekends Post which will be live every Monday on Life Love and Hiccups. For every one to get the most out of this Blog Hop, please remember to visit the other members. Enjoy and be inspired by their posts and share the comment love. Pin It This Chrissy I was super excited to participate in the Secret Santa organised by the fabulous Chantelle from Fat Mum Slim. We were each given the name of a blogger and our job was to totally stalk their blog then choose and send a gift we think they would love, all under the alias of Santa. I had so much fun stalking the lovely blogger I was given. I had never been to her lovely blog before I was given her name and I have had so much fun lurking in the shadows. I have been dying to comment at times and it took everything I had to hold back. I know she has received my gift and loved it so that makes me a very happy girl indeed. And can I tell you - I got so much pleasure myself out of receiving my own sweet parcel. One day last week a package arrived at my door addressed to me. Now at first I didn't get to excited as I have been getting to know a lot of courier companies lately as they deliver all the kid's pressies I have been ordering on line. But this parcel was special, because it was to me - from Santa. Now to say I was excited to open it would be the understatement of the century. And inside those pretty parcels was so much gorgeousness that I was a little overwhelmed to say the least. There was a fabulous Recipe book from Typo. 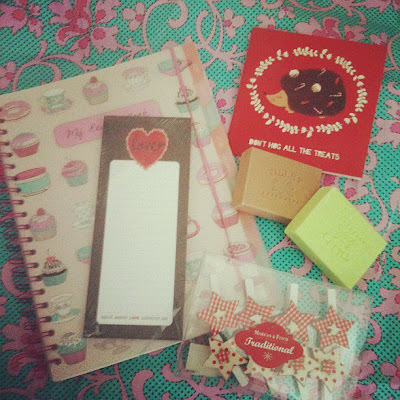 The most divine smelling soap, a beautiful fridge note pad and the most adorable little star pegs in my favourite colour, red. Oh my Secret Santa stalked me so well and I cannot wait to find out who she is so I can thank her properly. But until then - Secret Santa, THANK YOU so much. I absolutely loved every single one of my gifts, thank you for sending me such a lovely thoughtful and well chosen package. And a big thank you to Chantelle from Fat Mum Slim, because to organise all of this would of been no mean feat. Thanks hun. A Beachy Christmas Wreath - for the back door! Pin It Last weekend I decided the doors on my back deck needed a little Christmas jooshing. what I really wanted was a couple of wreaths like you hang on the front door, to decorate the back doors. I have seen some in good old Pinterest that tickled my fancy so I decided to give it a go myself. Take 2 little wreaths from Kmart I bought for 2 bucks each. and some star fish I had lying, along with some cute ribbon. I stripped the wreaths of all the decorations, until I was just left with a cute little blank canvas of a wreath. Then attached the ribbon to the wreaths. Hot glued in a starfish to the centre. And Bingo - 2 little wreaths to decorate the back doors. Pin It How many times do I forget things! That's a statement not a question - cause I so do not want anyone I know to answer that. The truth is the answer is way too often. The irony of it is I am such a list writer. I write lists for everything - heck I honestly even have a list that categorises my lists by topic. But in my defense, like so many of us I am juggling wayyyyy too many balls at any given time. Between trying to stay on top of work details, kids school details and dates, kids preschool dates, birthdays, play dates, Dr apps, Vet apps, sports events, sports training, birthday parties, social functions, deadlines, blog events, bills to pay, library book dues dates, video store due dates, prescription reminders, class mum responsibilities, kids soccer manager responsibilities blah blah blah blah is it no wonder I forget to pick a kid or 2 up from somewhere occasionally! Just joking - please don't call child welfare on me. So why do some people seem more together than me? That is the question I have asked many a people and it seems I am doing it all wrong. You see my lists are on separate pieces of paper stored around the house, in my desk, next to the bed and in my handbag. My daily calender is on the fridge AND in outlook AND on my i pad AND on my phone. It is no wonder I am so bloody confused. The answer was I needed a good diary. Something that captures all the stuff I need to remember in the one place. Somewhere I can make lists to my hearts content and not lose those lists 10 minutes later. Now I love me a good diary. There is something so exciting about writing for the first time in a fresh empty new crisp smelling diary. I get really kind of excited and giddy at the prospect of sitting down and filling out all the details in a new diary. The problem is all the diaries I have had in the past have never really met all my needs, so I got bored with them and abandoned them. It has a space for everything here. It seriously is the most practical diary I have come across. The diaries come in Pink, Green or Tiffany Blue. And Guess what? You can win one of these too because the gorgeous gals at Inner-B have given me an extra green one to give to a lucky winner. It is all wrapped up in its packaging just waiting for some lucky winner to start filling it out. 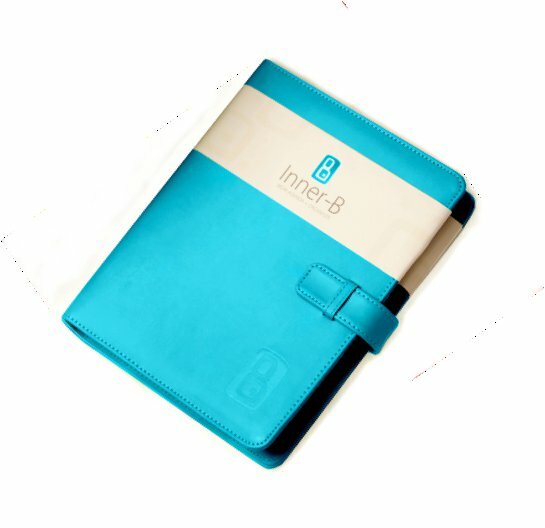 I have a special promotion code you can quote if you would like to order one of these diaries or any of the products from Inner-B. Yup, Life Love and Hiccup readers will get a whopping 20% off your entire order. All you have to do is place your order before Xmas and quote the promotion code LLH on your order. If you order a diary now and you are the winner of this diary here, Inner-B will credit you for the purchase of your diary. Oh Happy days!!! So here is how you can win this awesome diary. 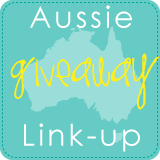 The GIVEAWAY will be run on The Life Love and Hiccups blog page. 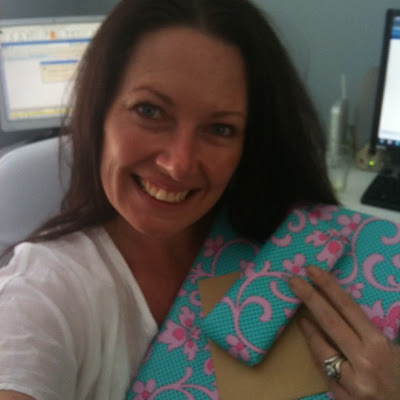 The winner will receive 1 Green 2012 Mum's Organiser. One lucky winner will be selected by random.org and will be contacted via email. The winner will have 48 hours days to make contact to claim their prize, otherwise it will be redrawn. STEP 1: You must be a LIKER of The Inner-B Facebook Page. GOOD LUCK and happy Organising!! Disclaimer: I was not paid for this post - I just think these diaries are totally awesome! Mangoes, Mayhem and the F word! Do want to learn how to make a complete and utter fool of yourself in your local grocery store? Perhaps you would like to totally shock the pants off your little ones with your colourful language? Want some tips on how to waste a tray full of mangoes whilst single-handidly causing probably the largest escalator stack in local history? Well then welcome my friends, you have come to the right place. Yup, I think you should lock me up and throw away the key, because in one brief minute I managed to undo years of hard work of parenting my children to be polite respectable members of society, and to top it all off, I now have to change shopping centres because I am too mortified to ever go back to my usual grocery store of choice. It was meant to be just your normal weekly grocery shop and it turned into something out of a bad documentary on how NOT to behave as a parent. We were on the escalator on our way down to the car park, with my shopping trolley full, 2 of my kids in tow and proudly perched on the top of my trolley was a tray full of succulent ripe sweet smelling mangoes. In hindsight, it seemed to happen in slow motion and if I close my eyes I can picture the scene of carnage like it just happened minutes ago. I am not surprised really as it is burned into my memory forever. The escalator shuddered and the trolley lurched forward. 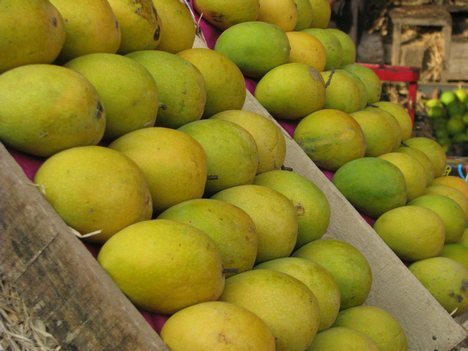 In a split second the tray of mangoes slipped forward and teetered on the edge of the trolley. I threw myself over the handle bar of the trolley to grab at the box and instead of grabbing it, I missed and launched the tray of delicacies into the air and then rolling down the escalator. I didn't think, I didn't notice the throngs of people around me and I certainly didn't consider my 2 boys standing next to me wide eyed watching the spectacle unfold. "OH F##K! F##K F##K F##K!!!!!" I was oblivious to the gasps as I was trying to stop my trolley from running over the mangoes and turning them into a smashed up slop of orange goop. In a miscalculated moment I didn't even stop to think when I left my trolley at the bottom of the escalator and grabbed at my precious mangoes rolling away, that all the other people and their trolleys would all crash into each other at the bottom of the escalator. People were screaming at me to move my trolley, some were crying in pain as their toes were run over by steel wheels, and others ... well the others were glaring at me with sheer disgust at the language at that had just come out of my mouth. I stood there with tears of shame in my eyes clutching my mangled mangoes. A kind man handed me one he had salvaged and I gratefully accepted the gesture. "I'm sorry" was all I could mutter to the crowd. A little voice woke me from my stupor. I took a big breath and mustered up the courage to face my little boy. "You said the F word!" Pin It Wow - what a busy weekend, but fabulously busy in a totally good way! I love this time of the year. It is crazy - yep. It is frantic - absolutely. It is tear inducing, headache provoking exhausting - you betcha! But oh it is such a fun time of the year. I love being an idiot and getting down and silly with the best of them, and there is something about Christmas time and the silly season that just screams - go for it you whacko, let you inner idiot free and get out there and dance with the rest of the loonies. I am a dork too. Oh yeah baby - a self confessed cheesy beyond belief dork. And the holidays just brings out the extra dorkiness in me. This afternoon I find myself wrapping up Christmas gifts with Michael Buble's Christmas CD rocking my Christmas mojo and I am singing along loud enough for the neighbours to hear me and for my family to question my sanity. But stuff it I say, cause I am feeling the Christmas cheer today! To say we have crammed a lot into this weekend, is a slight understatement. But after a busy week at work last week, it felt great to just let my hair down with the family. Friday night saw us at the kids school, bopping along to their Christmas concert. These photos are totally crap I'm sorry, but it was hard to zoom in on them from where I was sitting, and I felt to posy to take my new big Chrissy camera. So I snapped these shots whilst I was rocking along with the kids. Kai with the Santa hat on, singing up a storm. Oh lord, this photo is an ad for a botox candidate if ever I saw one. I love how kids are just so unselfconscious. They shake it and sing it like they're total rock stars and it is such a joy to watch. I so wish that we could keep that confidence we are blessed with as kids, and take in into our adult life. Saturday morning was all about Kar-ra-tay! Or grading day to be precise. Yup the boys got their yellow belts. Only about 50 colours (slight exaggeration) between them and their black belts now. The rest of Saturday was spent being totally girly with my gorgeous niece Meg. We hit the shops for a little retail therapy, then off to the Sushi Train for a fabulous pig out and some good old gossiping. After some afternoon refreshments we slothed out in style - (that's grand theatre style), at the movies to watch the festive chick flick - New Years Eve. I adore my niece Meg. She is the daughter I don't have and a carbon copy (personality wise) of me at her age. I don't have many photos of us from our day out as we were too busy spending up a storm and stuffing our faces to think of taking photographic evidence of our sins :) but we did snap one of us lounging out in the reclining chairs at the movies. I seriously do not know how I will ever go back to the normal chairs at the movies. I am a complete Grand Theatre convert! All we needed was our fluffy slippers and a blankie and we would have been right at home. Saturday night was dedicated to Glow sticks, Santa hats and and atrocious singing (on the adults behalf). It was all for a good cause though - Carols by Candlelight. We, along with some gorgeous friends, joined the other million people and spent the night picnicking under the full moon, singing and dancing and generally being goofs! I didn't get to take any photos of my older son Kai, because he and his mates disappeared for the night as soon as we got there. Apparently spotlight hide and seek is the new 'It' game again. Oh - don't you remember playing that as a kid. The grin on Sammy's face below is because in my merry mood I totally caved and allowed him to indulge in a whole can of coke to himself. This is like Christmas come early for him as Coke is usually a no go round these parts. Flynn and Dad being my lovable goofballs. Santa arrived in a fire truck and was completely set upon by hundreds of kids. Even I got excited and chased after him with them. I'm not sure what I would have done if I caught him, but I got caught up in all the excitement. I had no idea where my kids were in the rush - I left them for dead as I got lost in the moment. I had a near death experience, when they announced that Santa's helpers for the night were dressed in white and would be handing out bags of lollies. Yup - I was wearing white, and I was totally set upon by kids with the sniff of sugar fueling there ferocity and thinking I was the one who was going to provide their candy hit! Obviously I survived and that brings us to Sunday. A fabulous sleep in until 10.30 (courtesy of my gorgeous hubby), followed by a day of wrapping pressies, some more Chrissy crafting (details later this week) and grooving to The Buble. Even though it was a stormy day in Sydney, I was content to potter around at home enjoying the pre Chrissy preparations. All in all, it was a pretty Wonderful Weekend. So, your turn now - what did you get up to this weekend? Summer Summer where fore art thou my Summer? Pin It I love Summer. I adore everything about it - the heat, the sun, the smells, the clothes, the outdoor living, the beach. ahhhhhh! But seriously - it is about time Summer showed up around here! Heck we are nearly into January and Summer has been a serious no show. So to give it a little reminder of what it is supposed to look like, I have decided to pin some gorgeous Summer Pics I found on Pinterest. All these images evoke a feeling of bliss to me and they are symbols of the things I love and ways I love to celebrate summer. Getting our Crafty on - Christmas Style! Winner of The Baby Tooth Land Giveaway. A Very Smelly Start to Christmas. I am thankful for YOU!